Mechanic, Machinist, Draftsman, Turner, Welder, R&FC and other trades. Eligible candidates can register online at www.apprenticeship.gov.in. 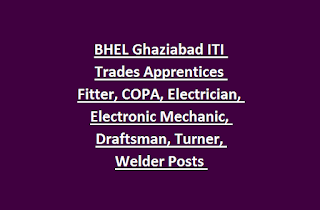 Last date to apply online for this BHEL Ghaziabad Trade Apprentices is 22-04-2019. 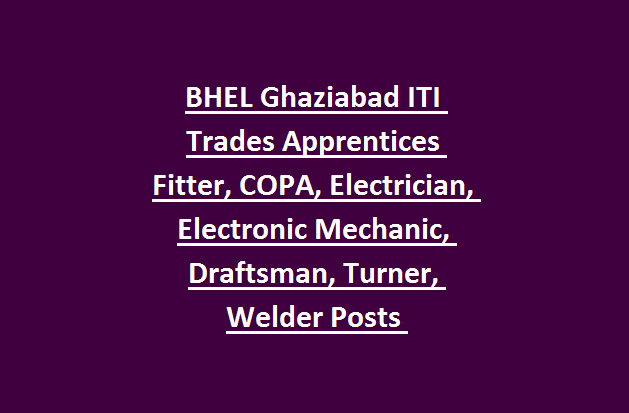 Initially candidates will be shortlisted for this BHEL Ghaziabad ITI Trade Apprentices recruitment 2019. Detailed information about this BHEL Ghaziabad ITI Apprenticeship Program is update below. There are total 150 ITI Trainee vacancies in this BHEL Ghaziabad recruitment 2019. ITI in relevant trade with 60% for general and OBC candidates. For SC/ST/PWD candidates minimum qualifying marks are 50%. For OBC candidates 31 years for OBC candidates and for SC/ST/PWD candidates 33 years. Candidates selection will be shortlisted based on merit in qualification for written test. Exam related information will be send to candidates registered mail id and phone number. Candidates who are qualified ITI they can register online at www.apprenticeship.gov.in website on or before 22-04-2019. Candidates must have enter currently using mobile number and the mail id at the time of online form registration or apprenticeship program.